"InMotion" Reviews (Apr 2019) - Why 4.9 Stars? InMotion Hosting is consistently one of the best hosting providers you'll find. You pay a bit of a premium for great support, powerful hardware, and supreme reliability, but the value of the product is market-leading. Whether you need SSD-powered VPSs or are ready to build your first site with its BoldGrid web builder, InMotion should be a top contender for your host. “Offering a wider range of services than most — including shared, dedicated, VPS, and even WordPress-specific plans — InMotion Hosting features a great combination of industry-leading hardware, always-there support, and mass scalability for all hosting needs. “InMotion Hosting offers an excellent business-class shared hosting plan. While carrying a higher price tag than some other cheap hosts, it has a very nice list of features to help justify the extra cost. “InMotion Hosting offers amazingly fast and reliable dedicated hosting on market-leading hardware — making it an easy choice for anyone seeking a premium dedicated server host. From free SSDs to a fanatical support team, InMotion has all the bases covered for both small-scale and large-scale operations. “Boasting market-leading VPS hardware, slick management software, and free SSD drives and backups, InMotion Hosting offers the most attractive VPS plans you'll find anywhere. “InMotion Hosting, long known for affordable and high-performance shared hosting options, entered the WordPress space with a solid option built upon the company's reputation for great support and reliability. Costing a small premium over other budget-minded options, InMotion does include some nice features to help justify that cost difference. “If you're aiming to build a dynamic, user-oriented website — an active blog, a photo gallery, an eCommerce store — check out InMotion Hosting. The InMotion team is extremely knowledgeable in the hosting industry, and they're attuned to the ever-evolving needs of the end-user — from the ultra-novice to the über-experienced. Evidence of the team's attention to user needs can be found in BoldGrid: the in-house-built website builder platform that was received so well by the market that InMotion decided to spin the web builder off into its own company. With InMotion, you'll benefit from a top-of-the-line server selection from Dell. Their first-ever green technology center is based in Los Angeles, California. InMotion invests millions of dollars into their hardware every year, including quality routers from Brocade and Cisco Systems. All InMotion customers experience the best speed and performance options with SSDs with SSH access on all accounts. Customers have access to hundreds of applications, including eCommerce solutions like PrestaShop and OpenCart. 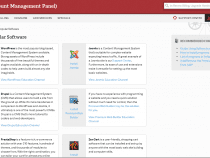 Many CMSs, blogging tools, apps, and scripts can be installed with one click. InMotion supports the use of the latest development languages and technologies, including PHP, Ruby, PERL, Python, PostgreSQL, and MySQL. To protect websites, SSH access is standard on all accounts and Business Hosting Server users benefit from BetterLinux. InMotion offers year-round, US-based support via phone, live chat, and email. The team can handle any level of support request, ranging from beginner questions to senior-level server management needs. New account specialists are also on hand to guide new users through initial setup. InMotion's Customer Community Team has authored thousands of how-to guides and tutorials, which are available online, as well as a community-based Q&A section. All InMotion accounts are covered by a 99.99% uptime guarantee as well as a 90-day money-back guarantee. They also conduct data backups automatically. Offering free SSDs and multiple datacenters for maximum speed, InMotion is sure to impress you on the performance side. In 2013, InMotion ranked #1 for domain transfers, which was no doubt in part due to their award-winning support staff. InMotion offers the most popular blogging and CMS software, including WordPress, Joomla, and Drupal. They make installing these features quick and painless, thanks to the Softaculous 1-click installation script, which is accessed within the easy-to-learn cPanel control panel. InMotion offers very affordable business-class hosting that is great for static websites, database-driven content management systems, and custom applications. You can also receive up to $300 in free advertising credits with any Business Hosting package! All accounts come with Premier Support™ consisting of five different communication channels to get your support questions answered. Their support team can assist with all challenges, whether you're buying your first domain or you're an experienced professional. Wondering how InMotion stacks up againt other web hosting services? See our host-vs-host reviews below and compare them side by side. 14 out of 16 times. If you're looking for extremely reliable support and performance-focused resources, you can't go wrong in choosing InMotion as your web host or server provider. Their network features multiple green datacenters, top-of-the-line hardware, and a 99.99% uptime guarantee. All account holders can expect high-tier performance and protection with SSDs and SSH access included on every account. New account specialists are constantly guiding new users through the setup process; even the most seasoned web users love the Premier Support™ and community-based Q&A section of the InMotion Hosting website. If you're ready for more speed, more resources, and more support, you're ready for InMotion Hosting.